How many places in the world can you jump into warm turquoise water right from your hotel room? NOT MUCH, probably the top places come to mind are the French Polynesia or Maldives. Either one of those two places are like far away dream that average working class like me have to work hard for years to make it a reality. Just by thinking about it…at least $2500 per person round-trip in airfares to get from Boston to Bora Bora and $1000 per night in an overwater bungalow…my thought stopped there! Early in January, I was looking for places to go as my 2014 New Year resolution and I came across an article by the Frugal Travel Guy: Travel Challenge: 6 Nights in Tahiti and Bora Bora for $87.20, my immediate reaction: shocked! Maybe my dream of Bora Bora wasn’t as far as I thought! First thing I did – opened an Intercontinental Rewards credit card for both my husband and I. We met the $1000 spending requirement each pretty easily as we had some electronics to buy earlier in the year. I kept checking the available rewards nights at the Intercontinental Thalasso-Spa Bora Bora daily and the available rooms over Christmas-New Year time quickly disappeared! By the time we got the 80,000 points, only rooms during the first week of January 2015 were available, we booked total 4 nights (50,000 points per night or 40,000 points + $70 per night and 80,000 points worked out to be 2 nights + $140). That 4 nights worth over $4000! I never have thought points and miles could save that much and that easy! Hubby had enough Hilton Honors points to redeem 2 nights in Moorea, French Polynesia. I have been receiving credit card offer mails over the years and all went quickly into trash, just too good to be true! After I booked the rooms with points from credit card, I finally believe credit card bonus points are not scams LOL! The hardest part after hotel was flights especially from the east cost – Boston. I read more articles about flights to Bora Bora and of course I looked airline credit card points! The best option I found was 75,000 AAdvantage miles roundtrip from Boston to Tahiti (PPT) with a free stopover in Hawaii!!! It is like combining two vacations into one! As we are getting the points around early March, American Airlines suddenly changed its mileage policy effective immediately – NO MORE STOPOVERS! That totally ruined my whole plan!!! Looking for an alternative with points and miles was like an impossible to solve logistic problem! I broke up into two parts….get to Hawaii and get from Hawaii to Tahiti. Hawaiian Airlines have one flight per week (Saturday) from HNL to PPT or PPT to HNL and cost 27,500 miles one way. The Hawaiian Airlines credit card bonus was 35,000 miles, enough for a one-way ticket and left with 7,500 miles (enough for a one-way flight to another Hawaiian Island)! Best thing about Hawaiian Airlines was that you can pay one way with miles and one way with cash without the extra one-way cost. You know how if you book a one-way ticket, it doesn’t equal to 1/2 the price of a round trip, in fact most of the time, the one-way ticket cost 75% of the round-trip tickets! I compared the one way cost of HNL-PPT and PPT-HNL and pay the more expensive one of the two with miles (since its fixed at 27,500 miles) and the other with cash which ended up to be $704 per person. It was more expensive than regular time because it was the holiday travel peak times and flights sold out fast! Round-trip from HNL to PPT cost around $724.50 if book in advanced and at non-holiday peak travel times. Those of you from the east coast and want to combine two vacations into one, fly to Honolulu usually around $600-$700 and then fly to Tahiti $724.50, that’s less than the price of $1800-$2000 just to get from Boston to Tahiti! Boston to Honolulu $1137 round-trip because we are traveling Christmas Eve! My Boston – Hawaii – Tahiti cost $1800+ but remember I am traveling over the holidays and visiting both Hawaii and Tahiti! Book rental car as soon as you can! You can constantly check for prices and if you see better deals, book and then cancel your original. A friend was planning to spend Christmas over Hawaii back in October and by that time, there’s no rental cars available in Big Island! Seriously, rental cars can be completely booked over Christmas – New Year week! Make reservations for Christmas Eve and Christmas Day dinners! Even though the holiday menu has not published yet, if you have a restaurant in mind, contact the restaurant right away! I contacted Hakone days before Thanksgiving and asked about Christmas Day dinner reservation, they replied back only available time is 7:30 PM and the menu has not published yet! Book special tours in advanced! I booked an off-door helicopter tour in Kauai on 1/2, I contacted Mauna Loa Helicopters Tour months ahead for a 2:30 PM tour but they only have 1:30 PM slot available! It’s important to note that Air Tahiti (flight between French Polynesia islands) has weight limit on carry-on….yes carry-on!!! Thankfully, starting from 1/1/15, they increased the limit to 11 lbs (5 kg) per person (check latest update at Air Tahiti website). But still, for photographers like us, I have a hard time trying to split the camera equipment between my husband and my carry-on. How are we going to squeeze two DSLRs, two lens, 1 GoPro, 1 stablizer, Microsoft Surface, chargers, batteries….into two bags for less than 11 lbs each??? That’ll be our biggest challenge, I’ll let you know how we did it (we still haven’t pack those two carry-ons yet)! 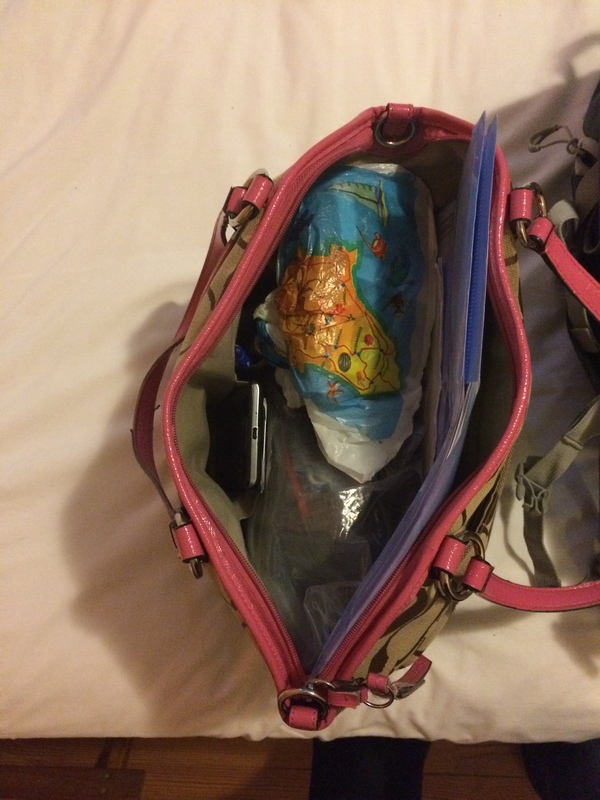 My purse: Canon 5D Mark III with 24-70 f/2.8 lens, GoPro, two cell phones, wallet, passports, small carryon bottle of insect repellent, insect repellent wipes, after bite stick, and itinerary….we weighted at 4 kg ~8.8 lbs! 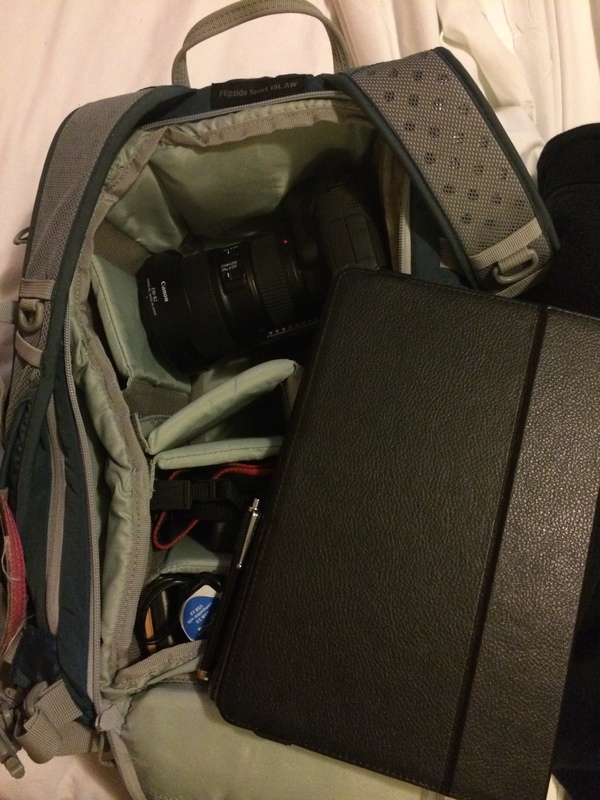 Husband’s purse: Canon 6D with 16-35 f/4 lens, Surface tablet, external hard drive, polarized filter, ND filter, camera battery charger, 2 spare batteries, card reader, and USB 3.0 hub…weighted 5.3 kg a little bit over 5 kg limit but we asked and the lady said no problem! We put everything else, including the stabilizer in the checked bag! First flight from Tahiti to Moorea, we didn’t see anyone’s carry-on being weighted! Insect repellent – this is very important as I heard there are bug problems in French Polynesia islands, check ingredients need 25% deet! We also bought the wipes so we can wipe ourselves once the plane landed and before walking out, it was very handy! My countdown has officially started!!! Check back for trip reports or follow my twitter: Miss_Vacation for pictures during my trip! ← Thank you for your support, I made it – Best Travel Blogs of 2015! Curious to find out what you packed. I always find it a challenge myself. That’s some serious island hopping! I hope you are enjoying your vacation and looking forward to the trip reports. Thank you! We completed Hawaiian island hopping now continue with French Polynesia! Love the travel hacking success stories! Great Post, I love this, you give me a exciting.